Today is my town’s annual food fair – the Godalming Food Festival 2012. Today is also the launch of my husband’s new community-based online channel. He came up with the idea of creating a local, online video channel when he realised there wasn’t really anything on the Internet that really brought our town to life. Since moving to Godalming over 5 years ago, we’ve really come to love our town but if you searched online for Godalming, all the websites are pretty bland and boring. What makes anywhere special? More often than not, it’s not just what a place might look like, but how a place feels. Since meeting all of the people in Godalming who have made us feel so welcome and happy, my husband came up with the idea of creating videos to bring the people and places of where we live to life. Most important of all, it’s all about the people – what they do, what they like and are like, because ultimately, it’s the people that give a place its character. 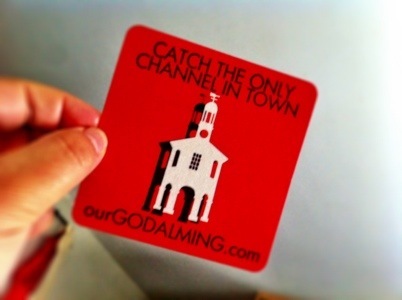 So after several weeks of filming stories about local people, ourgodalming.com is launching today. If you have a few minutes, please do go and check it out! Needless to say, I am so very, very, very proud of him. I was meant to be judging the Godalming Bake-off competition too before helping him promote his website today but I am instead laid up at home instead. I stupidly slipped in the rain yesterday morning and have ended up fracturing my foot. Oh the joys of British summertime weather… Thanks to this mishap, I will have to wait impatiently to find out what our townspeople think of the website he’s created for them. So sorry, Noodle, to hear of you injury. I hope you won’t have to endure that cast for too long. May things go far better with the launch! Good luck! So sorry to hear of your fractured foot. I’ve been there — twice. May you heal well and quickly. Congratulations to your husband on the new channel — the logo looks quite spiffy. Sorry to hear about your foot – sending speedy recovery thoughts your way. Congrats and I will check it out – YAY!!! Happy Saturday! How exciting – I’ll be sure to check it out! Congratulations on your husbands new channel, looks like a lovely view into your town. I will pop by from time to time. Hope your foot heals quickly.